Just prior to this year’s AAO meeting, I learned about a new potential laser treatment for retinal diseases. In looking further into this technique, I became convinced that, although it was very early in its development, it held the potential to become an important treatment in the armamentarium of retinal physicians. Therefore, I asked the company for access to the developers of the technology, and along with company-supplied information, here is a first in-depth look at Ellex’s 2RT (Retinal Regeneration Therapy). In July of 2005, Ellex, a manufacturer and marketer of ophthalmic lasers and ultrasonic diagnostic equipment used by ophthalmologists, embarked on a new five year plan that included a commitment to spend 1% of revenue on advanced research that could potentially change the practice of ophthalmology and its business. With this new charter and the funds set aside for it, the company set out to develop a laser treatment for early age related macular degeneration (AMD) in order to delay or prevent later vision loss with the belief that this treatment could significantly improve the quality of life of millions of elderly people and reduce health care expenditures worldwide. Professor John Marshall, the Frost Professor of Ophthalmology at St. Thomas’ Hospital in London (and the Chairman of Ellex’s Medical Advisory Board), together with his research colleague, Dr. Ali Hussain, have spent many years researching the underlying causes of AMD. Together Marshall and Hussein have become the world leaders in this area of research. Victor Previn, the founder and chairman of Ellex, together with Malcolm Plunkett, VP of Advanced Research, began collaborating with Marshall and Hussain to perform laboratory investigations to determine if a laser could be used to influence the early course of AMD by triggering a cell regeneration process that would improve the transport properties of Bruch’s membrane and thereby partially reverse the degradation that leads to Dry and Wet AMD. For this work, Ellex designed and constructed breadboard prototypes of two different laser systems to enable comparative studies. These laboratory experiments allowed the clinical researchers at St. Thomas’ Hospital, to discover the Retina Regeneration Therapy (2RT) device parameters required to induce the retinal pigment epithelium (RPE) to migrate and release matrix metalloproteinase (MMPs), the enzymes that clean up Bruch’s membrane. Further laboratory experiments that measured the hydro-conductivity of Bruch’s membrane have shown the whole transport mechanism of the retina is rejuvenated following application of laser energy according to the 2RT parameters. The Ellex 2RT program accelerated with the February 2007 award to Ellex of a 1.9 million Australian dollar (US $1.5 million) two year grant by the Government of Australia to support the development of a new and innovative laser therapy for the treatment of AMD and other retinal diseases. The grant was applied for to expand laboratory and clinical research in London and Australia with second generation prototype devices suitable for human clinical use. In broad terms, Ellex 2RT (Retina Regeneration Therapy) is the culmination of more than 30 years of experience treating retinal diseases with lasers. Ellex 2RT is a non-thermal laser treatment, using extremely short pulses of laser energy that ‘do no harm’ to the inner retina and stimulate the retinal pigment epithelium (RPE) to preserve vision. How does Ellex 2RT work? The Ellex 2RT laser system use a Q-switched green YAG laser to produce very precise 3 nanosecond pulses of 532nm light energy. Although there is no visual effect on the retina and no damage to photoreceptors when the laser is fired, the energy is absorbed and stimulates the RPE to trigger a renewal process (a sort of biostimulation), which reduces disease progression and preserves or improves functional vision. This system was developed specifically for Ellex 2RT laboratory and clinical trials by the Ellex advanced research team in Adelaide, Australia. Although there are many types of lasers used in retina research and treatment in ophthalmology, Ellex 2RT parameters are unique and can only be performed with an Ellex 2RT laser system. Ellex has international patents pending for the Ellex 2RT technology and method. What is the science behind Ellex 2RT? Laboratory research conducted under Professor John Marshall over the past few years has demonstrated that the Ellex 2RT method causes the RPE to migrate and release matrix metalloproteinases (MMPs), which are the enzymes that clean up Bruch’s membrane. Further laboratory experiments to measure Bruch’s membrane’s ability to transport water and chemicals have shown the entire transport mechanism of the retina has been rejuvenated. 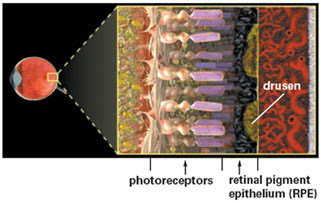 Photoregeneration is a term used by Ellex to refer to SLT (Selective Laser Trabeculoplasty – used in the treatment of glaucoma) and 2RT, which are both laser therapies that stimulate a natural biologic response in the eye to produce a therapeutic benefit without causing damage to the targeted structure in the eye. SLT is a photoregeneration therapy which restores the function of the trabecular meshwork to lower intraocular pressure (IOP) in glaucoma patients. 2RT is a photoregeneration therapy which aims to restore function of the retina in diabetic and AMD patients. What can Ellex 2RT potentially treat? Ellex 2RT is a candidate therapy for retinal diseases which are caused by a compromised Bruch’s membrane resulting in reduced energy supply to, and waste removal from, the photoreceptors. The diseases that can potentially be treated include early AMD, diabetic maculopathy and other retinal diseases. Why is Ellex 2RT potentially a better therapy? With Ellex 2RT, there is the potential to treat retinal diseases earlier, before irreversible physical changes occur and before patients experience significant vision loss. What is the current status of 2RT? At this point Ellex 2RT is a research program. Although early clinical data is encouraging, more trials are needed to establish the diseases that can be treated and the efficacy of 2RT for each indication. Product release will be dependent on the outcome of these trials. Peter Hamilton, MD, FRCOph, the principal clinical investigator in the Ellex 2RT research program at St. Thomas Hospital, London, presented the initial clinical trial results at the Retina Subspecialty Day of the 2007 annual meeting of the American Academy of Ophthalmology (AAO). Dr. Hamilton presented a preliminary report on 18 patients with diabetic macula edema, treated with the non-thermal laser treatment. With this technology, short pulses of laser energy were used to stimulate the retinal pigment epithelium. The 532-nm wavelength, used for a duration of 3 nanoseconds, created a series of non-thermal 400-μm spots on the pigment epithelium that does not damage the overlying retina. The study was designed to run for twelve months, with patient followup at three, six and twelve months post-op. The results reported were for the three-month followup. The prospective study included 18 patients (29 eyes), measuring progress with color photography and fluorescein angiography. The results at three months showed that central macular thickness (CMT), as measured with optical coherence tomography (OCT) (1), decreased by more than 5% in 16 patients (55% of eyes). It remained stable in seven patients (24% of eyes). And showed an increase in thickness in only 20% of eyes (six patients). A majority of the patients experienced an improvement in visual acuity. Microperimetry confirmed this increase in visual function in the majority of treated eyes and no evidence of laser damage to the photoreceptor cells in any of the eyes. (1)The OCT used was the Spectral OCT/SLO produced by Ophthalmic Technologies, Inc. (OTI), which contained a microperimetry option to assess the visual function of the retina and fovea as it relates to structural changes. The microperimetry runs simultaneously with the SLO (scanning laser ophthalmascope) and provides real-time tracking of retina movement and patient fixation. It allows the clinician to assess exactly where in the retina and fovea there is a visual function loss. It provides a quantifiable way to measure the regression or progression of the visual function of the eye. Dr. Hamilton said the advantages of the laser include: very short exposure time, visual acuity improvements, ability to treat close to the macula, no black holes visible at the time of exposure and good microperimetry. "We can get right in close to the macula without any fear of causing an enlarging burn." "Because this laser is so gentle and because it is not compromising the outer part of the retina, we can treat large areas." Dr. Hamilton concluded that further study is needed to compare the laser with conventional treatments. “The first phase clinical outcomes have confirmed Ellex 2RT’s ability to treat diabetic maculopathy without damaging the neuro-retina,” commented Professor John Marshall, principal investigator of the Ellex 2RT research program, “This means that Ellex 2RT may change the way diabetic maculopathy patients are treated and it shows potential for intervention in early stage Age-Related Macular Degeneration (AMD) before significant loss of vision has occurred”. “We are encouraged by the first patient data presented as it provides the assurance we were looking for to expand Ellex 2RT research,” commented Peter Falzon, Ellex CEO. “The next phase clinical trials will be essential in establishing Ellex 2RT’s potential as an early stage therapy for retinal diseases”. I have asked both John Marshall and Peter Hamilton additional questions about the technology and treatment, and will keep you informed as additional information about this unique laser technology and further 2RT clinical study data are released by the company. Irv, thank you for this summary of research to date. I look forward to updates on work of Prof Marshall and ascts. The prospect of an early / profylacticAMD treatment is exciting indeed. Irv, definite kudo's for your research! This looks to be an exciting development. In the Ellex press release they mentioned expansion of the tests internationally during 2008. Any idea how soon the tests of this treatment may be expanded to the USA? Concerned husband of an early AMD patient. As I learn more, I will continue to update the online Journal. i truthfully love all your writing type, very helpful.